Offering you a complete choice of products which include Industrial Sheet such as Color Coated Profile Sheet and Color Coated Galvanized Sheet. Being a highly effective, lean and fast-moving organization, we are highly instrumental in providing an extensive array of Color Coated Profile Sheet. 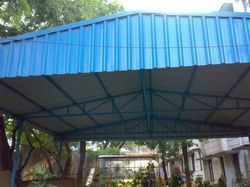 Used in various places like storage buildings or warehouses, exhibition halls, gymnasiums and glasshouses, offered profile sheet is designed using optimum quality raw materials and modern technology under the guidance of our adroit professionals. In sync with set industry norms, this profile sheet is tested by our quality examiners on varied parameters so as to ensure its quality.